Of the half a dozen mass market art paperbacks you might find in your local good book store, there may be at least two biographies of Michaelangelo Caravaggio. In addition to this, the latest, there may be another recent account by Peter Robb. That book, called M, emulates the passions of the painter’s life with a lyrical, some might say hysterical, tone. So plaudits should go to Graham-Dixon’s balanced account. Whether digging up period documents or looking closely at the paintings themselves it is a better read. Caravaggio: A Life Sacred and Profane debunks the conspiracy theories surrounding the painter’s tempestuous life. Not assassinated, he quite likely died of a heart attack. Of course some circumstances remain mysterious. However the artist escaped from a dungeon on Malta, thrown there by the island’s Knights, is to this day a riddle. Another topic of wonder concerns the painter‘s craft. He appears to be self-taught. He never bothered to draw. And yet, he became one of Europe‘s most influential talents. Graham-Dixon even tracks his influence as far as modern day Hollywood, as we learn that Mean Streets (1973) by Martin Scorcese owes its urban sensibility and lighting to the painter. But what to make of his argumentativeness, his ever present sword and dagger. He even went so far as to sleep fully armed in Sicily, a man on the run. That image too, is a gift to cinema or literature, but has there ever been an artist in fiction with quite as much violence and passion as this real archetype, possibly not. Incidentally, while still reading this book I came across reference to a 1994 exhibition in Floria Brown Gallery, Woody Creek, Colorado called Two Guys With Guns Making Art. Those two “guys” were William S Burroughs and Hunter S Thompson, neither primarily known for the plastic arts, but unwitting heirs of Caravaggio all the same. 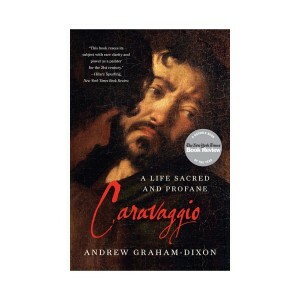 This book can be found in your nearest good bookshop or, if you must, Amazon, along with a deluge of titles devoted to the life of Caravaggio.